Enjoy this coveted top floor, oceanfront, condo nestled on 60 lush acres, part of a protected mangrove forest, entered through a private road and gatehouse. As you walk in the door you will be greeted by an immaculately renovated suite and the blue green colors of the Atlantic giving you an immersion in seaside, coastal living.. This furnished apartment will offer you all of the comforts of home as it features a large flat screen TV, premium cable, WiFI, dining table, and work space. The Master bedroom is dressed in island finery with a lush queen sized bed, an on-suite bathroom, walk-in shower and flat screen TV makes for the perfect retreat. The kitchen is fully equipped, featuring modern stainless steel appliances and granite counter tops, for cooking, entertaining or making yourself a fancy drink. The washer and dryer are located conveniently inside the apartment. 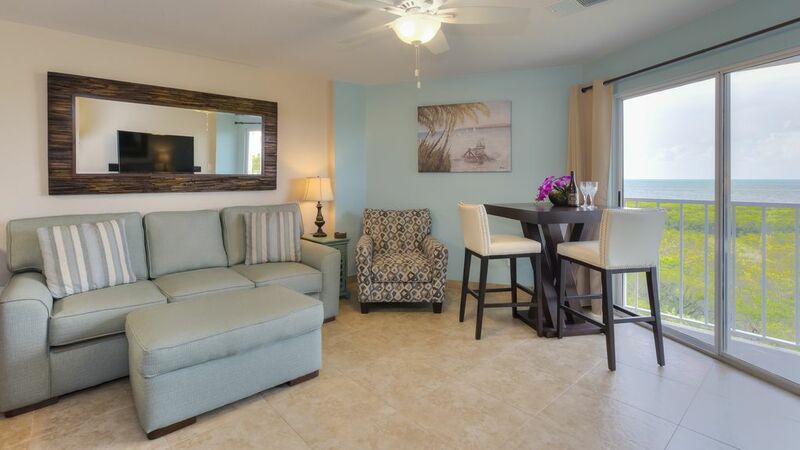 This lovely condo has everything you need for a sun and fun vacation getaway for two! Your condo will come stocked with the following items in your Welcome Kit to get you started for a fun and relaxing stay in the Upper Keys: two rolls of toilet paper in each bathroom; two rolls of paper towels in the kitchen; dishwashing capsules; laundry detergent capsules or liquid; one pack of shampoo, conditioner, and body wash in each bathroom; trash bags; hand soap; and dish soap. The bathroom has a new walk in tiled shower, comfort height toilet, vanity and medicine cabinet. The oven has a glass window. There are more baking pans in the drawer below. Salt and pepper and a couple of spices and sugar as well as coffee filters, plus any other goodies you may find in there. There are plenty of cabinets stocked with dishes, cooking pans, tea pot, casserole and baking pans as well as pizza pans, etc. A new kitchen granite counter tops, stainless steel appliances and plenty of cabinets. You can eat in the kitchen at the dine in counter top or at the high top table with high back chairs. There is a good assortment of books for your use. The balcony is small and fits two chairs and an end table. Rent kayaks from PADDLE The Florida Keys! Two beautifully maintained courts and I have two tennis rackets in the unit for your use. I also have tennis balls for your use. Very beautiful large Jr Olympic sized heated pool. Perfect retreat in the Keys! Tucked in a gated community on 60 acres makes this a very quiet, tranquil place to escape to enjoy the area. The condo is beautifully decorated, has a kitchen well equipped for meals in, and everything was very clean. The common areas—pool, beach, tennis courts, and cafe—were all well maintained and clean. Finally, awesome landscape to enjoy. Tammy, Thank you for sharing all the things you loved about our condo and the resort! It was such a pleasure having your family as our guest. We are thrilled to have another 5 star rating and you all are welcome back any time! We truly enjoyed our stay, the condo and property were very well kept. The condo has everything you could possibly need. We loved our stay at Ocean Pointe. The condo was very well appointed and very tastefully decorated. We loved the amenities at the resort included the pool, beach and very friendly staff at the restaurant/bar. We are getting married in the area and will be recommending our family to stay at this property. This condo was terrific to stay in during our stay in the upper keys. Very clean and had everything we needed for our stay. The location is nice to either head to Key Largo or the other way to Islamorada or further. We enjoyed relaxing at the pool and the beach, both had access to beverages and food while relaxing. Great condo and would recommend to others wanting to stay in the upper keys. Thank you for sharing all the things you loved about our condo and the resort! We are thrilled to have another 5 star rating and you all are welcome back any time! My husband and I enjoyed our stay in this attractive condo that has a beautiful unabstructed view of the water. It is well maintained and is delightfully quiet and peaceful. Thank you so much for the kind words and glad your stay with us was everything you expected and more...we welcome you back anytime!